Last week (it was Shrove Tuesday), I found 5 pancakes in the freezer, and I also had about half a tub of ricotta (left over from Spinach gnocchi), a piece of Stilton, some double cream and a small amount for fresh spinach. I decided to make these pancakes, so I bought a butternut squash. Heat 1 tbsp of oil in a heavy bottomed saucepan. Add the butternut squash and cook slowly until it begins to change colour, mixing occasionally. Add water to cover, bring to the boil and simmer for 10 minutes. Drain. Heat the remaining oil in a large saucepan and add the onion, cooking gently for 5 minutes. Turn up the heat, and add the spinach, stirring constantly until all the spinach has wilted. Turn off the heat, and add the butternut squash and mix well. Beat together the ricotta and 3/4 of the Stilton, and stir into the vegetable mixture. Season with black pepper to taste. Take a pancake and spread it with 1/5 of the mixture . Roll up the pancake and place in a shallow ovenproof dish. Repeat this with the remaining four pancakes. Sprinkle the remaining Stilton over the rolled-up pancakes and pour over the double cream. Place in the oven at 180C (Gas Mark 4) and cook for about 20 minutes (or until golden brown). Serve. In praise of fat again! Why is it, that people attempt to create ridiculous ‘healthy’ versions of things which are only delicious because of a generous helping of fat, sugar, or anything else deemed to be harmful? 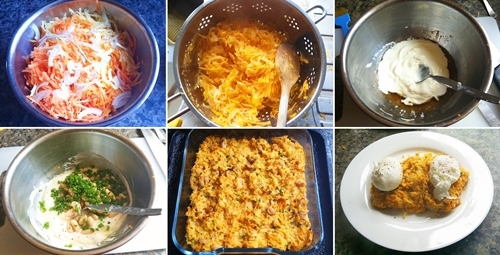 I decided to make Vegetable Rosti Pie (it should really be called Vegetable Rosti Sludge) which featured in the Waitrose ‘Winter Harvest 2014’ recipe booklet (and – another whinge – why doesn’t Waitrose put these things on line?). This recipe has NO oil/fat in it apart from some in the low fat yogurt. I Googled ‘Rosti‘ and the first link I got was How to cook the perfect rösti (clearly authentic as ‘rösti‘ was spelt properly (with an umlaut)! ), which suggests using goose fat. Why are we bombarded with inferior versions of things that are excellent in their original form? For example, this recipe for millionaire’s shortbread from a raw food fanatic. It may look like millionaire’s shortbread if you have bad eyesight and the light is really dim, but it will taste (and feel) like something completely different (and certainly not like the version Thornton’s do)! Blanch all the vegetables in boiling water for 3 minutes and drain. Mix the beans, parsley, olive oil, yogurt, coriander and black pepper in a large bowl. Add the vegetables. Mix well, and press into a lightly greased ovenproof dish. Cook at 190C (gas mark 5) for 40 minutes (or until the surface begins to brown). I will make this recipe again, but I shall be ditching the yogurt and olive oil for a generous helping of goose fat, and I will also omit the cannellini beans which seem to add nothing (except protein), and have a rather unpleasant texture when they start to brown. Cut the butternut squash in half lengthways. Scoop out the seeds (if you like you can roast these at the same time as the squash – remove the fleshy fibrous bits, mix with a little oil and salt, and roast (on a baking sheet in the bottom of the oven) for about 15 minutes (take a look after 10 minutes)). Put the two halves of the butternut squash on a baking sheet. 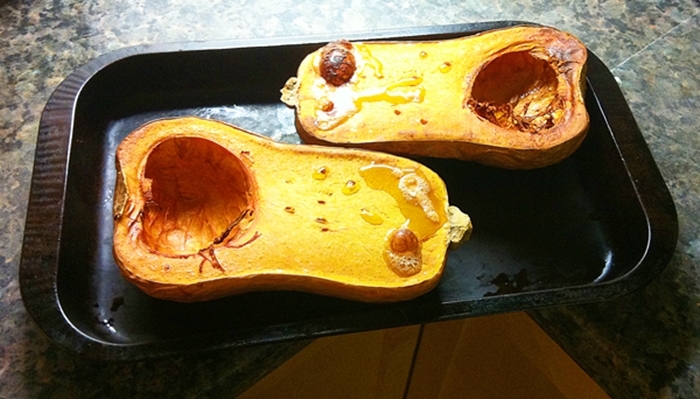 Pour a dessertspoon of oil into each cavity and brush over the surface of the squash. Roast for 40 minutes at 180C (Gas Mark 4). Put the potatoes in the oven at the same time. Meanwhile, heat a tablespoon of oil in a saucepan. Stir in the onion and gently cook for 8 minutes. Add one clove of garlic (crushed/chopped) and the oregano, stir and cook for 2 minutes. Stir in the tomatoes, bring to the boil and simmer for 20 minutes. When the butternut squash is cooked. Cube one of the halves (the other can be used in soup or risotto) and add it to the tomato mixture (I skinned my squash, but you can eat the skin which is quite tasty, but it does affect the texture of the finished dish). Add the butter beans. Season with black pepper, and ensure all the ingredients are evenly distributed. Pour into a shallow ovenproof dish. If the potatoes are cooked, slice them into 1cm slices (if they need a little more cooking I suggest that you finish them in the microwave before slicing). Place the potato slices on top of the tomato, squash and bean mixture. Melt the butter and the remaining garlic in the microwave (about 40 seconds at 750W). Brush onto the potatoes (use a brush which won’t melt!). Sprinkle with the grated cheese and black pepper. 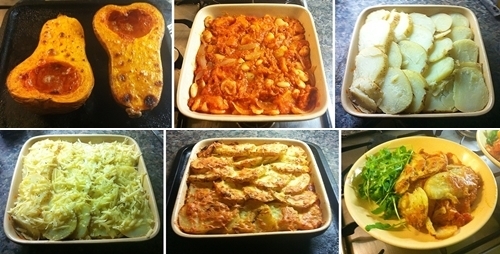 Cook in the oven at 180C (Gas Mark 4) for 30 minutes (longer if you are cooking the dish from cold). Serve. I served mine with wild rocket (65p at Lidl). Heat the oil in a thick bottomed saucepan (cast iron pots such as Le Creuset are great for this). Add the onion and fry very gently for about 5 minutes (stirring as necessary). Add the garlic, chilli and red pepper and carry on frying and stirring for 3 minutes. Add the rice, and stir so that it is coated in oil. Add the stock powder, the thyme and enough hot water to cover the ingredients. Bring to the boil and simmer very gently for about 20 minutes (add the butternut squash after 15 minutes) until the rice is creamy but still has a slight ‘bite’. You will need to add more hot water occasionally and stir the mixture from time to time (I know everyone says that you need to constantly stir risotto, but I find that this is unnecessary provided you use a thick bottomed pan and a very low heat). When the rice is cooked, stir in the cream. Return to the heat and stir until the mixture is just boiling. Turn off the heat, stir in the cheese and add black pepper, salt etc to taste. This soup (for 2) is made in exactly the same way as the ‘soup’ part of pork belly noodle soup, but the main ingredients are different. 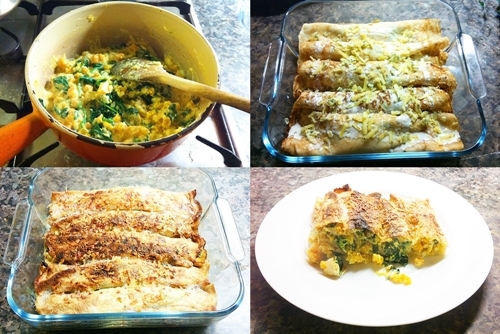 When I cooked this last night, I added half a small red onion (chopped), to the ginger, garlic, chilli and lemongrass mix at the beginning of the recipe (and dispensed with the spring onions at the end), but this makes little difference to the finished product. To roast the butternut squash, cut it in half lengthways and scoop out the seeds (you needn’t throw them away – here’s a recipe for Toasted Butternut Squash Seeds (beware it’s an American recipe and the oven setting is in Fahrenheit: 300F is about 150C (Gas Mark 2))). Place the two halves (skin down) in a roasting tin and roast for about 45 minutes at 180C (Gas Mark 4-5). You could cook the squash from its raw state when simmering the spices, curry paste, coconut cream, nam pla and stock, but I intend to make a roasted butternut squash and red pepper risotto later in the week, and thought I might as well roast the whole squash. In two large bowls, place equal quantities of noodles and soup, and top with chopped coriander. If there is insufficient liquid add some hot water. Eat! 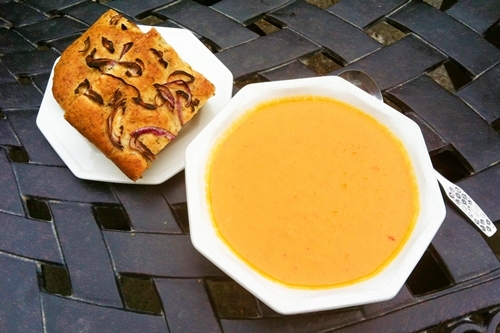 I have also made a vegetarian version of this soup. I swapped the salmon for tofu, and used vegi-stock instead of fish stock.